Taking care of all your heating and cooling needs so you don't have to! For heating, cooling, ventilation and light plumbing repairs you can count on, trust Air Pros Heating & Cooling! We’re the foremost HVAC experts in Marion, IN and the surrounding areas, bringing more than a decade of expertise to every jobsite. Contact us today—24 hours a day—when you need heating and cooling service. It’s easy to overlook the convenience of your home or business’ HVAC system… until something goes wrong. Then, it’s a race to fix things before your comfort and quality of life begin to suffer! Luckily, Air Pros Heating & Cooling is always ready to offer you the heating and AC repair in Marion, IN you need to set things straight again. We’re available 24 hours a day, 7 days a week to provide you with reliable repairs. We arrive quickly and ready to work, backed by the tools and expertise to conquer any problem, no matter its cause. When you call us for AC and heating repair in Marion, IN, you’re getting a level of quality and dedication that’s unmatched. We make sure everything is in perfect working order before we leave your jobsite, and we can help provide you with the information you need to keep things working properly between service calls. We even offer light plumbing repair for water heaters, water pumps and drain lines, giving you an all-inclusive reason to call us for service. Air Pros Heating & Cooling is ready to build a lasting relationship with you, so you can live and work comfortably with an HVAC system that’s always reliable. We have 24-hour emergency service available for your convenience. Our business is EPA-certified, showing our standards for excellence. Our service capabilities extend to both residential and commercial customers. We service the entire Marion, IN area and can travel to your location up to 40 miles away. We’ve been a locally-owned and –operated business since 2001! Heating and cooling problems can’t wait for a resolution—they need expert attention right away! Contact Air Pros Heating & Cooling today for immediate service you can count on. 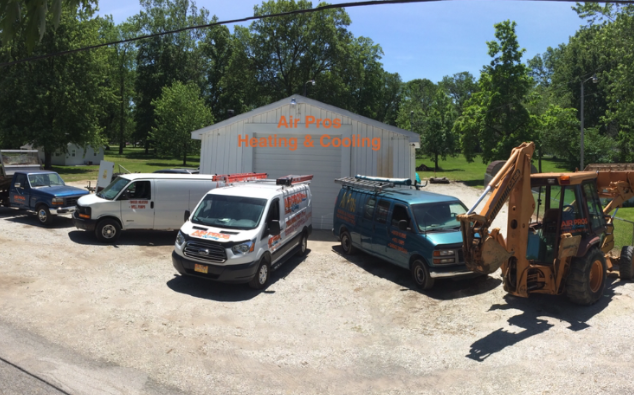 Open 24 hours, 7 days a week because HVAC doesn't take an off day! "After calling the dozens of other heating and cooling companies in Marion with no response, PJ and Dan with Air Pros H&C came out immediatel..."
"Thank you for the service was great price they did their job and it was amazing. I would recommend this to anyone out there in the world. Th..."
"Awesome service! The owner came out and Instantly found the problem and fixed it for a great price! So thankful, will be calling again and r..."
"FAST HONEST REPAIR ON MY GOODMAN A++++ALL THE WAY!" "Both Dan and PJ did exactly what they said they were going to do. They replaced our total system for the more efficient Ducane system which ..."